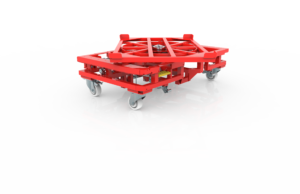 The purpose of using the production trolleys are their cooperation with platforms together with they create complete transport systems. These system are also called the “milk-run” solution. The milk run bases on the rule of delivieries being done to many different points by a single supplier. In our case it means that tugger train delivers materials packed onto trolleys to a specific production line points and take the empty trolleys on the way back. That mean it’s a huge difference between tugger train solution and the use of forklift trucks – you can optimise your delivieries by the changing the way of intralogistics material handling. 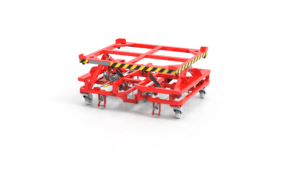 The outcome of tugger train material handling implementation can be a decreasement of intralogistic costs both in the meaning of needed time for deliveries, lenght of the routes. 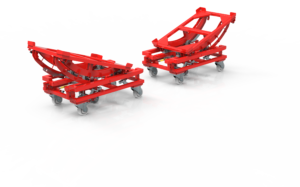 Production trolleys used together with transport platforms in which they are being docked allow for fast and reliable materials and components deliveries.